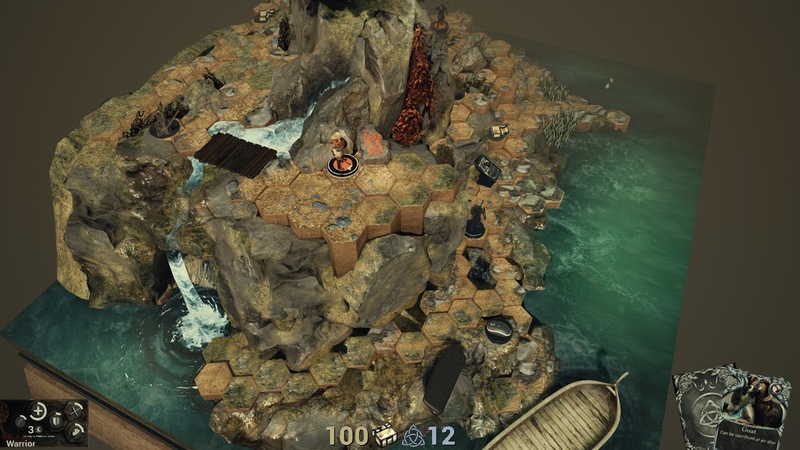 Wartile, developed by Playwood Project and recently released into Early Access on Steam, is a game not quite like anything I have played before. The fresh take on tactical RPG combat has you moving detailed figurines of various Viking warriors around a static, yet beautiful diorama battlefield. The deliberate effect is to give the feel of playing a board game, with all the advantages of being a digital game. 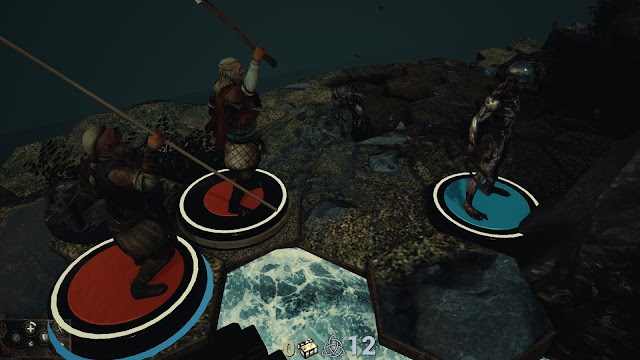 Combat takes place in real time, but each figure can only be moved once every three seconds or so. 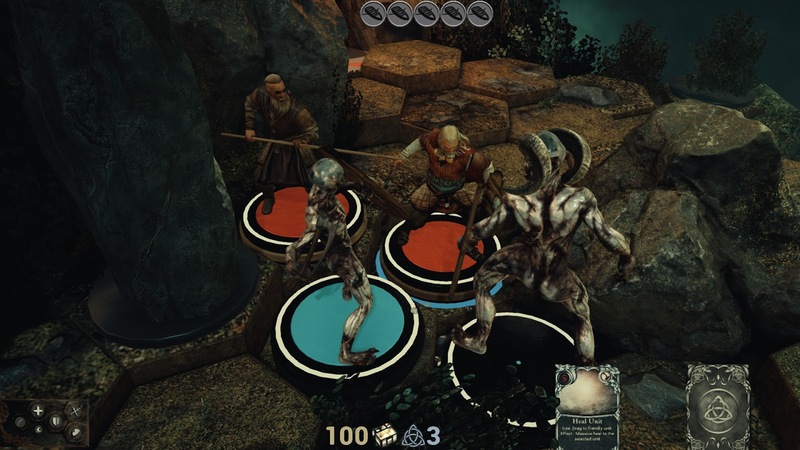 Standard attacks are made automatically once an enemy is in range, while special abilities can be activated by dragging the relevant card from the player's "hand" onto the target. 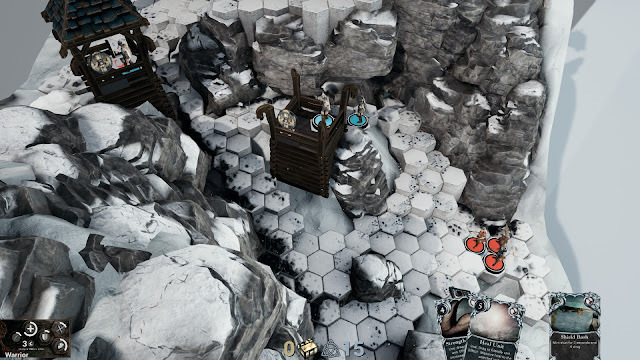 This design creates a sort of controlled frenzy, where the player only needs to take a couple of simple actions every few seconds, but must be constantly thinking ahead. Positioning of units makes all the difference, with relative height, flanking attacks, and leveraging the terrain in your favor all factoring in to making sure your fighters prevail. Each fighter under your control belongs to a particular class. There are damage dealers, shield bearing tanks, spearmen who can attack from two spaces away, and more to come. Putting each figure in the appropriate place is critical to keeping them alive, as you are often outnumbered. A tactic I exploited early on was holding a narrow pass with my shielded warriors, while my spearman attacked freely from range. Whenever there is room you will want to keep your men moving, getting behind enemies to get a flanking bonus to each attack. Enemy figures will keep moving as well, adding tension to the melee. 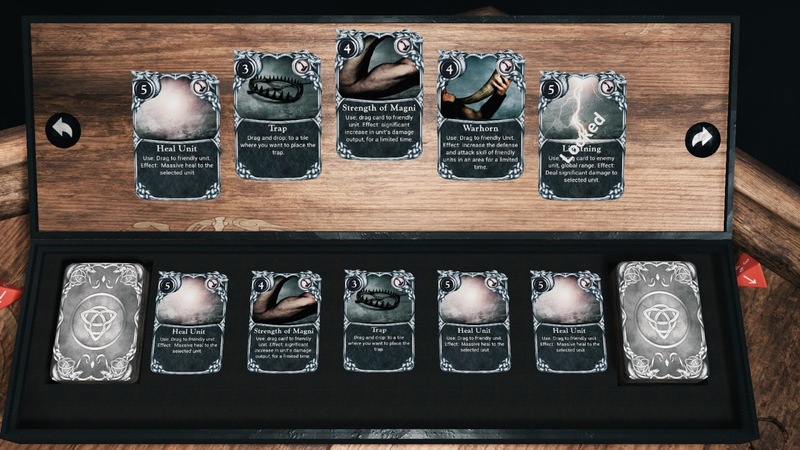 As mentioned before, you have a hand of cards, independent of the individual characters' abilities, that let you activate special powers at any time. This deck of cards can be customized before starting a scenario, and is then dealt out randomly, two in hand at a time. Using these abilities depletes a limited supply of points, which must be recharged over the course of the battle. Early cards include healing, boosts to damage, and a trap which can placed on the map. As you complete scenarios, more cards are unlocked and can be mixed into your deck. Playing these cards at the right time, and only when needed, is another factor the player must keep in mind as a battle unfolds. 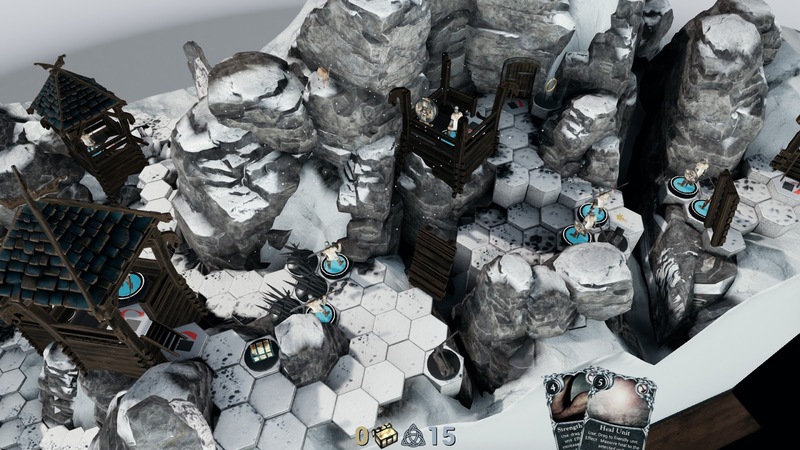 Between scenarios the player can spend gold to purchase new figures and other things, as well as customize the figures he has. Armor and weapons can be equipped, as well as small bonuses to stats that can be swapped around as you like. Like any RPG, the further you get into the campaign, the more variety of options you have for customizing each character. You can make your figures into glass cannons, tanks, or balanced fighters. As characters level up you can add more stat bonuses, and they can be reset at any time, so you are free to try new strategies as you go. It is certainly worth mentioning again how lovely this game looks. While the environments lack any animation, this actually works wonderfully. The whole thing has a very hand crafted feel to it, channeling those detailed battlefield dioramas you see in museums. I especially liked the crashing waves frozen in time and other cool details spread across each stage. One thing I hope to see changed is freeing up the camera a bit more. There may have been an option I was missing, but I constantly found myself wishing I could tilt the camera more, so that I could take in beautiful landscapes from more angles. The game also has a multiplayer mode, which I haven't tried yet, but expect will certainly force you to adopt more imaginative tactics. While the AI will give you a good challenge, it won't throw too many curveballs your way in its current state. Most of the surprises come in the form of sudden events which add new enemy figures to the board, usually in prime position to outflank your warriors. Despite being in early access, I did not encounter any bugs or glitches during my first few hours of playing Wartile. I was happy to see that, despite the impressive visuals, the game runs perfectly smooth and loads almost instantly on my machine. There are a lot of positive things happening here, and I look forward to seeing more content added to the game over time. It's always good to see someone take a new approach to game design and aesthetic. 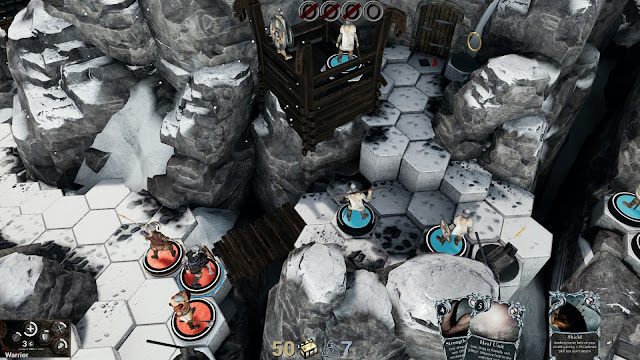 This could have been a bog standard turn-based combat game, but instead it steps out, through visual design and game mechanics, into uncharted territory and that makes it a welcome breath of fresh air.